In the Land of Invented Languages, which bears the exhausting subtitle Esperanto Rock Stars, Klingon Poets, Loglan Lovers, and the Mad Dreamers Who Tried to Build a Perfect Language, is, for me, that rare, rare bird: the popular nonfiction book that doesn't feel like a magazine article stretched past the breaking point. 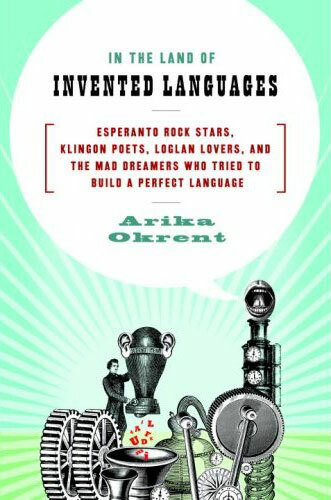 Arika Okrent, the author, has an undeniably fine touch when it comes to outlining both the interesting technical features of these invented languages, and the interesting features of the weirdos who devote their lives to these things. It's kinda like Word Freak, for, well, word freaks. The premise of the book is a breezy revue of the highlights of constructed languages through the ages, starting with the Lingua Ignota of medieval abbess and weird spiritual polymath Hildegard von Bingen, and winding up, eventually, with the Klingon language created by Marc Okrand from (very bare) seeds planted by James "Scotty" Doohan. I preferred the earlier stages of the book, which were more historically distant, more rooted in utopianism ("Hey, let's invent a language that will end all war! "), and just plain more exotic (e.g. Blissymbolics). But the latter parts of the book are by no means a letdown, and I'd recommend it in a heartbeat to everyone I know who is particularly tweaked by thinking about people thinking about language. In the Land of Invented Languages is neither too technical to be accessible to those with only a casual interest in the subject, nor too light to be interesting to those with a more serious and abiding curiosity about conlangs (and natural languages too). I wish we weren't in the midst of gearing up for the Spring textbook season, because I would love to sit all day typing about constructed languages and this terrific book about constructed languages, but alas, it is time to pay the piper. Communciation should be for everyone, not just for an educational or political elite; that is how English is used at the moment.